If we're connected on Instagram, you may have noticed that I've been majorly cleaning out my closet. My personal style is changing, and I have things hanging in my closet that I haven't worn in a couple years (or EVER!) that I'm finally willing to let go of. I plan to spend the weekend sorting and pulling my stuff to sell and swap and to do the same for my kids' stuff. By next weekend, I'd like to list items on both Poshmark and Swapdom. If you're on either of those sites, we should connect! You can find my Poshmark closet under "Indiana. The first ten people who use code BGUII to download the mobile app on a device will get a $5 credit when you sign up at poshmark.com/getapp. I sold a couple things back in 2012, and I recently bought a couple things. The community has really grown since 2012, and I'm looking forward to trying it out as a seller again. You can find my Swapdom profile under "Indiana" as well. New members can use my referral code if you'd like. I haven't used Swapdom at all yet, but I think it's a great way to get new items without having to spend a lot of money. A few bloggers that I really like are on Swapdom, and I want to see for myself how it works, especially since they have a kids' category. 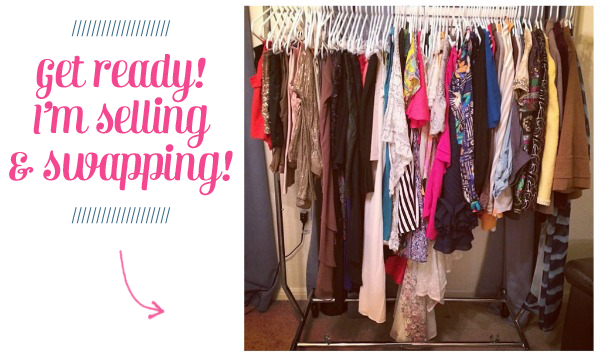 I'm excited to downsize my closet and to swap items thoughtfully. I haven't listed anything on either site yet, but I'll Tweet when I start uploading things. In the meantime, I'd love to follow other sellers on Poshmark and other swappers on Swapdom, so if you're on there, let me know! I'm curious: If you've used Poshmark or Swapdom, how was your experience?